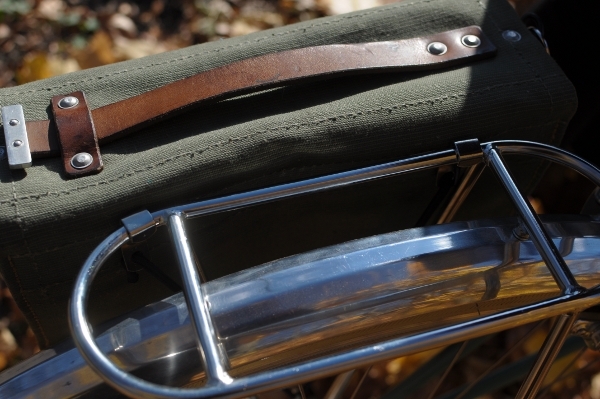 The OYB Pannier is a small Swiss army surplus bag, modified via the addition of rack attachments and other features by Jeff Potter - the owner and author of the project Out Your Backdoor ("indie outdoor lore and more"). I purchased this bag as a smaller alternative to the enormous shopper pannier I normally use. My criteria were durability, classic aesthetics, a trustworthy attachment system, a reasonable price, and a size just large enough to snugly fit my medium format camera equipment or my (very small) laptop. While I am aware that these same bags (without the bike-ready modifications) can be purchased from several other sources, I opted for the OYB version because I wanted the modifications to be made by someone with experience and because I wanted to support the "Out Your Backdoor" project, which provides some great resources for its readers. Compact and boxy, the pannier is a Swiss military bag made of a thick, stiff, olive-green waxed canvas with brown leather trim and steel rivets. The OYB leather patch is a lighter shade than the rest of the leather on the bag, but this can easily be changed with a modest application of neatsfoot oil or even Proofide. I am not sure whether this particular bag started out as new-old-stock, or whether it had been used in its previous life, but to me it looks more like the former. The condition is better than I had expected based on the pictures and product description on OYB. The closure system is simple and secure: That very stiff leather cord pulls out of the metal loop, and the thick leather strap lifts up off the loop to open the bag. 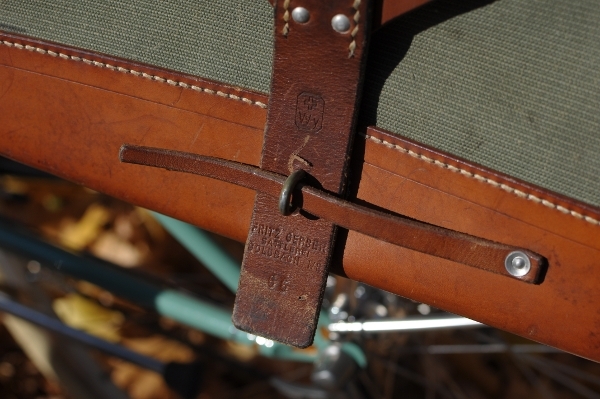 For those curious, the imprint on the leather reads "Fritz Gerber Sattlerei, Goldbach." 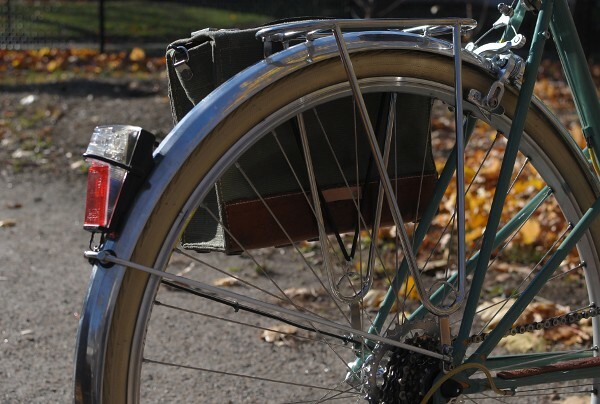 The attachment system is a combination of metal hooks and bungee cords, with which the pannier is secured to the rear rack. 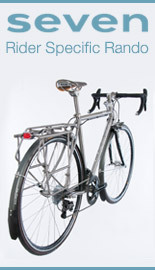 The rack I have on this bicycle is the Constructeur rack from Velo Orange, which is quite small. Here is a close-up of the metal hooks. They are riveted on to the bag. 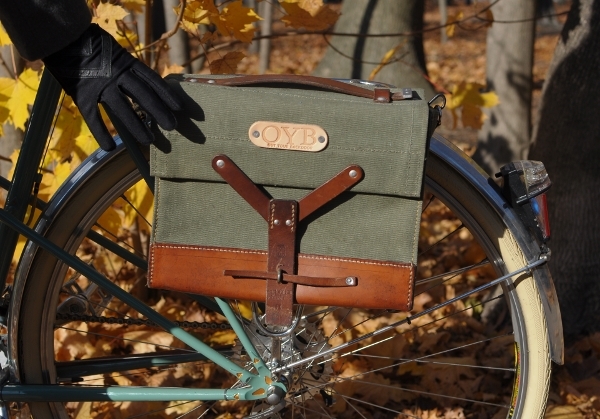 In addition to the rack attachments, the OYB pannier can be ordered with a number of other optional features, including shoulder strap attachments with a removable shoulder strap. I asked for the strap, because I pan to carry the bag around when off the bike, and this set-up essentially this gives me a camera bag and pannier in one. Other options include lights mounts, and a variety of other attachments. To give you a sense of scale, here is the pannier in relation to me and to the entire bike. It is a small bag. Dimensions are listed as: 8.5" tall, 4" deep, 11.25" wide (5.4 liters). Inside, the length of the bag is listed at 10.75", but I was hoping against hope that it would fit my laptop. OYB gives instructions for stretching the bag out with magazines in order to make it fit items of that size, and I will give this a try. If I can get my laptop to fit, I will be thrilled - but I am not getting my hopes up and am prepared to content myself with this being a camera bag only. If it were not for the laptop fit issue, this would pretty much be my dream pannier. The mil-spec colour scheme is not for everyone, but I love it, and it suits almost all of my bikes nicely. The durability of military surplus items is superb, and I appreciated getting the bag customised by Jeff at OYB. 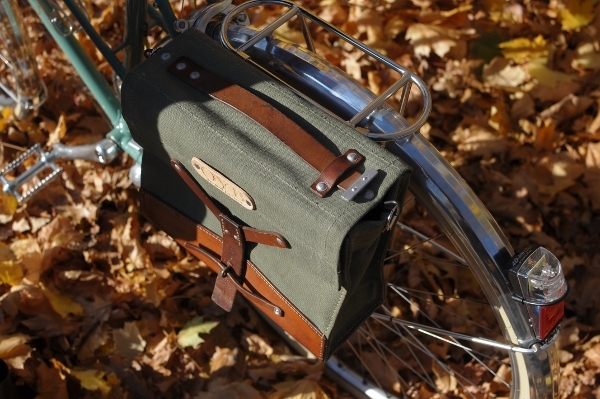 This is a classic, versatile, and reliable little pannier refashioned by someone who loves bicycles. 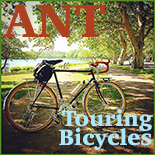 edited to add: I have sold the pannier since the review, only because it was too small for me. I loved everything else about it. Love the bags, hate the overlarge and inappropriate logo. Maybe the DIY project would be to get rid of it? I noticed that cool bag on yesterday's post. I've been looking for a not- black bag to turn into a pannier for Gilbert. I'm so crazy about the Ortlieb system, that I think I'd customize it myself, and am still holding out for something all brown, but it's a great looking bag! It really is a nice size. And it complements your mixte perfectly. Fingers crossed the stretching out works for your laptop. nice pannier. i saw those surplus swiss bags on ebay over a year ago and considered making my own, but opted against it because i thought they were just a bit too small. they are very nice, however. are the hooks chromed steel or stainless? do you get any rattling/rubbing against the rack? Anon 3:08 - I don't mind the logo at all. I am going to proofide it, so that it's the same colour as the rest of the leather, but left it in the original state for the review pictures. One reason I like the logo, is that it makes the pannier look less like an actual army bag, which I prefer. But for those who don't want the logo but want the OYB customisations, I am sure he can send you a bag without the badge, no DIY necessary. somervillain - Not sure about hooks (will check when I get home later), but I think stainless. Definitely no rattling against the rack. I would actually really like to turn a black leather satchel I own into a pannier, but am worried I'll ruin it. It is made of thick and stiff leather and I do not currently own any tools that would allow me to attach hooks to it. Has anyone done this, and if so, how? I've been looking for a small, semi-permanent pannier for my commuting, now that it's summer and I don't need my rain-jacket or woolies. I love the design (and the logo). Perfect! Lovely Bag- it looks like it would last forever. The fastening is gorgeous, though I do have to agree that the logo is a little bit clumsy. Valouria - I think transforming your own bag is a great idea. I might give this a try and post the results. Just to clarify, there is no way this will fit a laptop, not even one as tiny as a Macbook Air. Maybe a Netbook or some sort of iPad/e-book reader, but not a real laptop. I haven't tried Apple's new 11" Macbook Air, so I can't say whether that would fit. 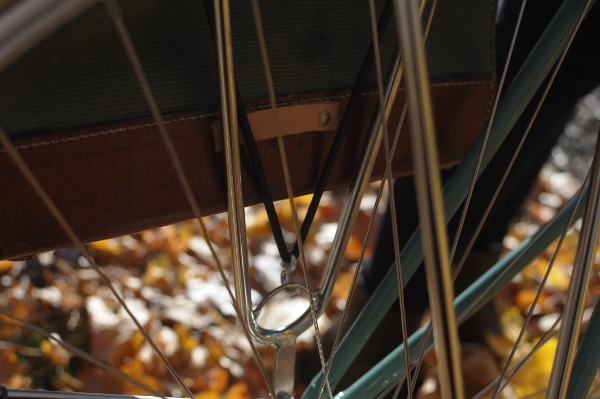 The little loop of leather on the bottom inside serves as a place for the elastic bungee to go through before it clips onto the loop ring of the rack. I forgot to do that part, which you can see in pictures. If you do it properly, it won't bounce at all, the attachment is very secure. So, this is a wonderful little bag, but tiny! I know Velouria seems to have liked it a lot, but I fear many people will find it not large enough to occupy the pannier spot. Velouria, when I saw this pannier on your Sunday blog I was going to comment and ask you about it, but didn't get the chance. And, here it is, so happy to read your review. I love the compact size and the color. Exactly what I had pictured in mind to buy. So, thanks for saving me some google search time. Though, I still may spend a little time on comparing with other similar size panniers. But, I do love this one. MDI - Are you sure about putting it through the leather bit first? To me it seems better this way, but I'll try it the other way next time. The dimensions of the pannier are accurate, so any disappointment over the size is not through any fault on the product's part. Neat bag. Modifying your other leather bag sounds like a job for a good shoe repair person. (or your neighborhood Mennonite harness-maker if you live in the menno-ghetto like me)You can also ask to borrow Somervillian's pop-riveter(he seems like the type who's probably got one and knows how to drive it) and get some 3/16" shank aluminum rivets with 5/8" heads and rivet whatever straps/clips you want onto your bag. 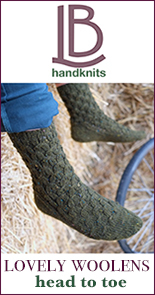 Use a small washer on the other side from the head and gently flatten it all out with a hammer when you finish. I have an old leather Swedish military cartridge box that I did something similar to so I could use it for a seatbag. It looks way cool and I can now carry up to 20 rounds of 6.5x55 ball, tracer or armor piercing ammo with me at all times. Oh, and a tube. I love my set of ammo bags and find them quite handy. Perfect for what I need to take to work (since I don't need to bring a laptop). Ipad fits nicely along with small camera, snacks, hat/mittens/scarf/U-lock. They are also VERY water proof. Mine are not OYB's, but just ammo bags that I had picked up awhile back and fitted with leather straps to hold to the rack. I thought about getting those bags to use as panniers. I still might, as they look like they'd be good for carrying papers or other small loads, if not a laptop. I think OYB is a neat concept. As you know, I'm using one of their seven-way bags as an underseat bag. (I've mentioned it on my blog: http://midlifecycling.blogspot.com/2010/11/just-what-this-girl-needs-another-bag.html. Jeff says it could also be used as a pannier, which I don't doubt. But it would make yours seem like a Carradice Super C by comparison. I thought the Out Your Backdoor guy was Jeff Potter. If there's been a changing of the guard over at OYB, I wish Jeff the best - I chatted with him on a Rivendell ride up Mt Diablo once. Nice bags in any case. Nice review of a lovely bag, but unless he changed his name when I wasn't looking, the fellow behind OYB is Jeff Potter. Sorry yes, it's Jeff Potter! I mistakenly used the other name, because it was credited in the product description for the name "International Model Perfection Pannier". Hmmm... 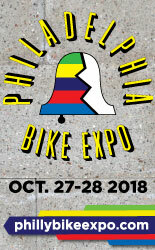 I have a very nice leather saddle bag (as in horses) that would be great to carry things in on my bike. The question is, how do you attach it to the bike? The idea of rivets sounds good if done properly. But, what is properly? I would like to see pics of any leather bags that have been modified if anyone has any. JimP - That is my point as well. I have seen a number of DIY attachment systems that I would not use on my bike, particularly when carrying camera equipment or a laptop. One reason I got the OYB pannier rather than attempting to attach hooks myself, is that I have heard good things about Jeff's work via word of mouth. Thank you for the review. I think I might get a pair as front panniers. And I like that he will customize details. I'll have to think about that... blinky light loops certainly come to mind. Thanks for posting your thoughts on the bag. I showed it to my husband and he offered to buy one as part of my Christmas. Since I do not have a basket on my bike the bag will be perfect for holding my wallet, camera, etc when I'm out riding. Hmmmm . . . . I think my husband would like one of these! I've come so close to buying one of those several times but the size is just a tad too small. It's a shame because other than that, they are ideal. I the exact same kind of Swiss Army bag, but mine is made into a handlebar bag--these are way too small to function as panniers.